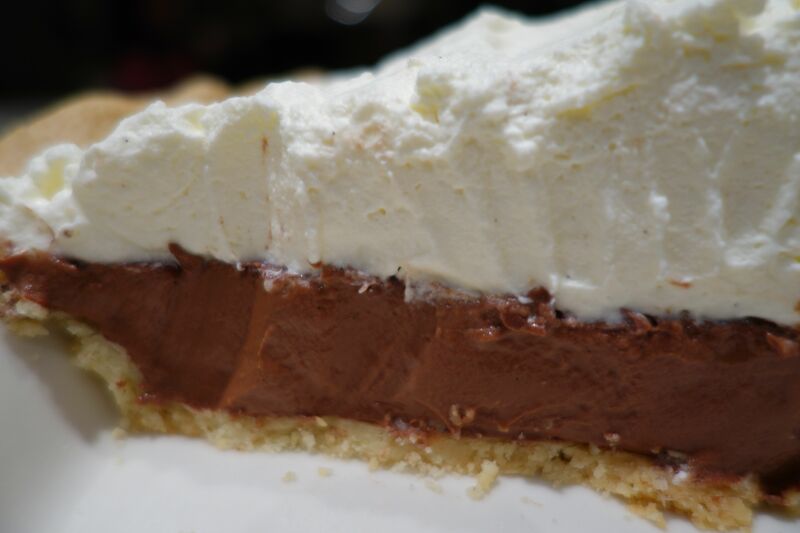 This pie is equally delicious on a short crust, a chocolate cookie crust , or a graham cracker crust, it’s your choice ! Bake for 15 minutes. Cool before filling. 1 ¼ cups Nabisco Chocolate wafers- blitz in food processor until crumbs resemble sand. In a bowl, combine all ingredients. Using your hands, press mixture into pan. In a med sized pot, combine chocolate chips, cornstarch, salt, sugar,and cocoa powder. Slowly whisk in milk and turn stove on to a medium heat. Whisk constantly until mixture comes to a boil. Pour into pie shell and refrigerate for at least 2 hours. Before serving beat whipping cream until firm. Top the pie with the whipped cream. This entry was posted on Friday, November 8th, 2013 at 4:12 pm	and tagged with chocolate pie, chocolate pudding, easy chocolate pudding pie, homemade pudding, refrigerate, whipped cream and posted in Category. You can follow any responses to this entry through the RSS 2.0 feed.